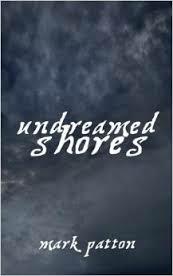 My debut novel, Undreamed Shores, was published a year ago today. At the time it was available only as an e-book, but my publishers, Crooked Cat, who had been in business for less than a year, soon expanded their operation to include paperbacks. They are publishing my second novel, An Accidental King, later this year but, if I appear to be churning them out at a rate of one a year, it's an illusion. I started work on Undreamed Shores in 2006, and penned the first sentences of An Accidental King in 2009. It's just that it takes a whole lot longer to edit a book than it does to research and write it, and I'm not sure that spending a whole year just editing (300 words a day or thereabouts) would be good for my sanity, so I've always started on the next book before the current one is ready to submit. Before I published Undreamed Shores I undertook a brief survey of fiction set in prehistoric times (it's on my website - www.mark-patton.co.uk/id8.html). There's a fair amount of it, but the corpus includes only a handful of truly memorable works. It was interesting, therefore, that, whilst I was writing my novel, two other writers were, quite independently, working on very similar projects. J.S. Dunn's Bending the Boyne came out a year ahead of mine, and J.P. Reedman's Stone Lord appeared soon afterwards. The three books are set within a few hundred years of each other (between 2500 and 1900 BC), and the paths of our protagonists cross repeatedly. No doubt we were all inspired by a series of dramatic archaeological discoveries in the early years of this century, which somehow seemed to make the distant past more immediately accessible on a human level. 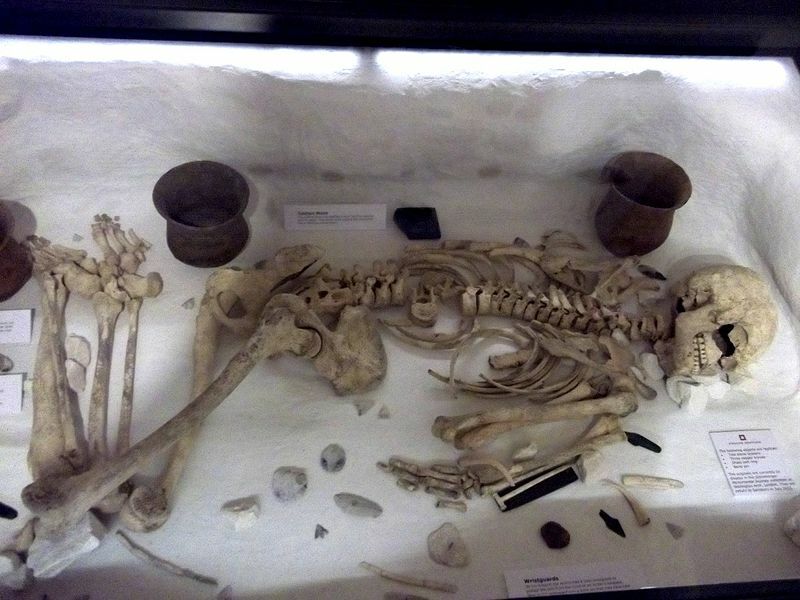 It can hardly be a coincidence that each of the three books includes a character based on one of these discoveries - the so-called "Amesbury Archer" (www.wessexarch.co.uk/projects/amesbury/introduction.html). The remains of the "Amesbury Archer" (Arthmael in Undreamed Shores), as displayed in the Salisbury and South Wiltshire Museum. Since the publication of Undreamed Shores, more tangible flesh has been added to the bones of Britain's prehistoric past than words alone can provide. 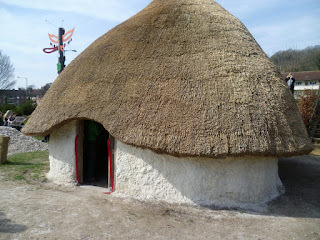 Some of the houses that I describe have been reconstructed (http://neolithichouses.wordpress.com/about) by English Heritage, and they are pretty much as I imagined them. The boat in which my characters make their epic journey has also been reconstructed (www.bbc.co.uk/news/uk-21681465) and, to the relief of all concerned, it does actually float. A Neolithic house reconstructed at Mouslecomb Primary School, Brighton, on the basis of evidence from Durrington Walls (Wiko-Elawar in Undreamed Shores). The reconstructed Bronze Age boat takes to the water in Falmouth. 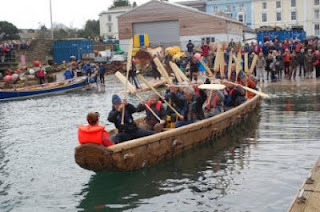 One of the perils of writing historical fiction based on archaeological evidence, rather than the conventional written history of more recent times, is that one chance discovery tomorrow could change our whole picture of what life was like at a given moment in time. New research on Stonehenge has been published since I wrote Undreamed Shores and, if I had known then what I know now, some of my detailed descriptions might have been a little different. In broader terms, however, many aspects of the society portrayed by Dunn, Reedman and myself seem to be confirmed by the most recent research: a society poised on the edge of the most profound technological, social and religious change; in which new conflicts emerged as people travelled more extensively than their parents or grandparents had ever done, establishing new relationships between communities that had previously lived separate lives. Such depictions are necessarily "of their time" - I can only present the society of 2400 BC as it is understood in 2012/2013. Someone writing a similar novel in 2050 will probably see things very differently. Mark Patton's novels, Undreamed Shores, An Accidental King, and Omphalos, are published by Crooked Cat Publication, and can be purchased from Amazon. Your photograph of 'A Neolithic house reconstructed at Old Sarum' is a photograph of a Neolithic house in the grounds of Moulsecoomb Primary School, Brighton. For identifying location features, keep an eye out for council housing and a totem pole! Thank you for pointing this out, Alex! My late mother would have spotted the council housing, as she lived around the corner from it. I had the idea to write a novel based on the concept of the Archer King, born in the Alps and traveling down the Rhine to cross to England. Now have just discovered your book. I shall have to read it first. There are many more stories to be told about these characters! His journey is only briefly sketched as back-story in my novel, so you have plenty of scope: good luck with that! Hello, Mark. Is Undreamed still available? I've not been able to locate it for sale anywhere. I miss you His Fic Crit site. Hello Harry, it's not currently available (unless there are second-hand copies): I'm hopeful that I will find a way of bringing it back into circulation, but Amazon are putting a financial squeeze on small publishers.